Saturday, September 15, 2018 – City Island Yacht Club Sayers Series. Sayers Series Race – Henry Sayers Commodore of CIYC 1926-1927 raced Water Witch, a John Rodstrom schooner yacht and this CIYC Members Only race is a tribute to him. Our history is amazing. Don’t miss an opportunity to get your boat and crew chronicled into this wonderful CIYC history. AND IT’S FREE. Sept 15th the annual Members Only Sayers Series Race. Not just for serious Racers. This is a chance for Cruisers to show just how good they are too! Enjoy complimentary Bagels, Donuts and Coffee at 9 am. Scratch Sheets including your individual start time will be available at 9 am. First Race is at 11:00 am then it’s back to the Clubhouse for Buffet Lunch. Enjoy Chicken Francese, Pasta Primavera and a Green Salad until it is time to race again. Second Race is around Hart Island. 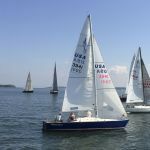 Sailors will join back at the club for Race Results, Music by Nancy Cirianni and her band, and our famous CIYC sunset. Dinner is to be ordered off our menu with delicious specials by Chef Edwin. No Spinnakers, no Spinnaker poles, No whisker poles. No Reachers, Bloopers, Whoppers or anything else that doesn’t attach to your headstay. It’s a pursuit start. The time your boat starts is determined by your rating. Slower boats start first. Faster boats start later. Everybody finishes together. No drama, No crunching seen at the starts of other Races! The AM start will be at 11:00 AM. At 11:00 there will be one long horn signal; begin your count up for your pursuit start from there. The PM race will begin after everyone has finished lunch. PM course will be L (to Port), then around Hart Island either way – your choice. NOTE: The Blauzes, C “3”, Gong “1” and the Day Mark “46” are marks of the course and sailing between a mark and Hart Is. will result in a DSQ. Then back to L (to starboard this time) and on to the finish. Please monitor VHF Channel 72 throughout! Don’t forget…No poles of any sort! Until your start, please endeavor to stay far enough from the start line to not impede boats that are starting. Everybody have a good time.